The A337 has better seal efficiency and safety, due to its MicroLock seal less system. Australian Warehouse Solutions are the exclusive distributors of the Fromm A337. The MicroLock seal less system secures the steel strap to itself without the use of a seal. The A337 can handle regular duty and high tensile steel strapping up to a thickness of 0.64mm. The A337 is a suitable tool for a wide range of vertical and horizontal strapping applications. 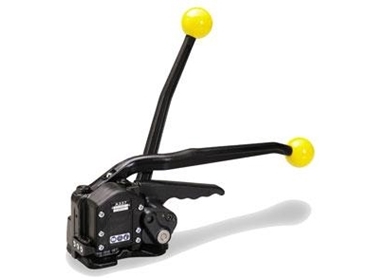 The A337 is lightweight (4.45kg) and has comfortable long handled levers for useability. The A337 is guaranteed to make light work of manual steel strapping applications.